The Collections Department has been busy preparing for the Museum’s newest exhibition, Flickering Treasures: Rediscovering Baltimore’s Forgotten Movie Theaters. The exhibition features a survey of Baltimore’s movie theaters from 1896 to the present. The Museum has roughly 250,000 artifacts in its permanent collection. Still, with exhibitions like Flickering Treasures that cover a specific topics we frequently rely on other institutions and individuals lending us items to enhance the exhibition. For Flickering Treasures we borrowed over 125 artifacts from 20 different sources, including the Jewish Museum of Maryland, the Baltimore Museum of Industry, and numerous private collectors. Some of the most fascinating artifacts in this exhibit survived demolition and destruction because a handful of individuals saved them and held on to them for years. One such example is this hanging lamp from the Metropolitan Theater made of iron, brass, and sheets of colored mica glass. The lamp, which features images of the Greek god Pan, is on loan from long time Baltimore residents Calvin and Sarah Buikema. The lamp was hanging in their house when the Museum learned about it. The Buikemas generously allowed us to visit their home multiple times to determine the safest way to remove, pack, and transport the lamp. Once at the Museum, our Registrar secured permission for the lamp to be gently cleaned and dusted to bring out all of the gorgeous details. We also received permission from the Buikemas to hang and light the lamp—a delicate operation that involved coordination between our, chief preparator, master carpenter, and our contract electrician. As you can imagine, there were audible oohs and aahs from our install team when the switch was flipped and the light came to life! The incorporation of this one artifact took hours of staff work and support from the lenders. In addition to site visits, packing, transporting, cleaning, and installing, there was the time spent creating the loan agreements, working with designers to determine its location in the exhibit, and reviewing the layout to determine where power could be pulled from. Our master carpenter even built the hanging structure in the ceiling specifically for the lamp and he had to modify the design as we figured out more details for the display. Even so, it’s easy to see why we consider the effort worthwhile. 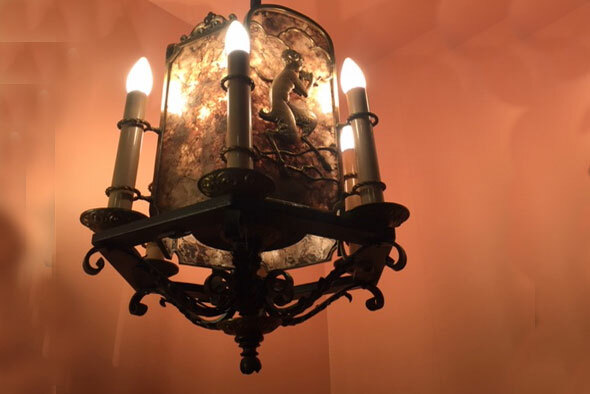 Turning a corner in Flickering Treasures to see the beautiful lamps and sconces that adorned Baltimore’s most opulent theaters transports visitors to a different time and place. You are able to see up close details that may be lost in a photograph or less compelling in a description. We feel so grateful to meet and work with lenders from all over the country, who share our passion for preserving and displaying history. We hope you’ll be able to visit Flickering Treasures and take along a new perspective on what it takes to get an artifact from someone’s home and onto a museum wall!